A team of University of Rochester students recently won the National Geothermal Student Competition, an annual inter-collegiate contest sponsored by the U.S. Department of Energy that promotes innovation in geothermal energy development and technology as a clean energy solution. The team, made up of undergraduates Kidus Alemayehu '15 and Leah Sabbeth '13 and graduate students David Brink-Roby and Talor Walsh, was one of four semi-finalist groups to advance to the final round of the competition. Held in conjunction with the GEA National Geothermal Energy Summit in Reno, Nevada, June 26-27, the contest challenged students to explore cutting-edge technologies and clean-energy solutions by crafting a business plan to develop a geothermal enterprise. The Rochester team's idea utilized underground coal seam fires as a geothermal energy source. Underground coal fires occur when a coal seam is ignited by a natural or man-made source; these fires can burn at temperatures of over 1200�C for hundreds of years. Using a coal fire in Centralia, Pennsylvania as their source of inspiration, the team proposed creating "Inferno Energy," a company that uses the heat from coal fires to produce geothermal energy, a source of clean electricity. "Our project builds on existing geothermal energy," explained Walsh of his team's ambitious plan. 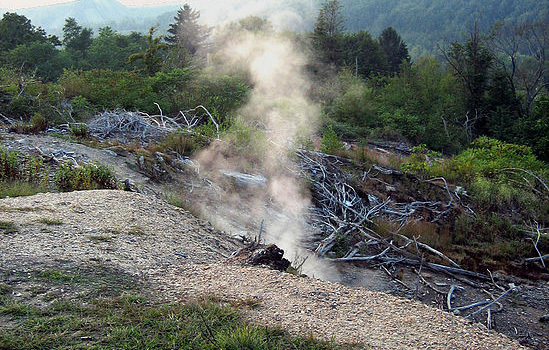 "Coal fires are a huge source of pollution and almost no research is done in that area. The ideas we present will be targets for our continuing academic research." Gautam Mitra, professor of earth and environmental science, served as the team's advisor. "They did the project all on their own, without having it interfere with their regular research work," said Mitra. "Plus, they beat out programs from western schools that specialize in geothermal development. It was a very impressive achievement." The Oregon Institute of Technology, University of South Dakota, and California Polytechnic University, Pomona placed second, third, and fourth in the competition, respectively. All four semifinalist teams presented innovative geothermal business plans to industry leaders, which were ranked by judges based on written and oral presentations. The Rochester team received an award of $5,500 to complete their business plan, which will be used to conduct research and further their studies.